The Median Home Sale Price rose dramatically in August to $325,000. This is $125,000 more than July’s report. Even though previous months had been hovering around the $250,000 mark, this is still worth taking note. 53% of the home sales ranged from $200,000 – $750,000. The remaining percentage of units sold were spread out almost equally above and below these marks. 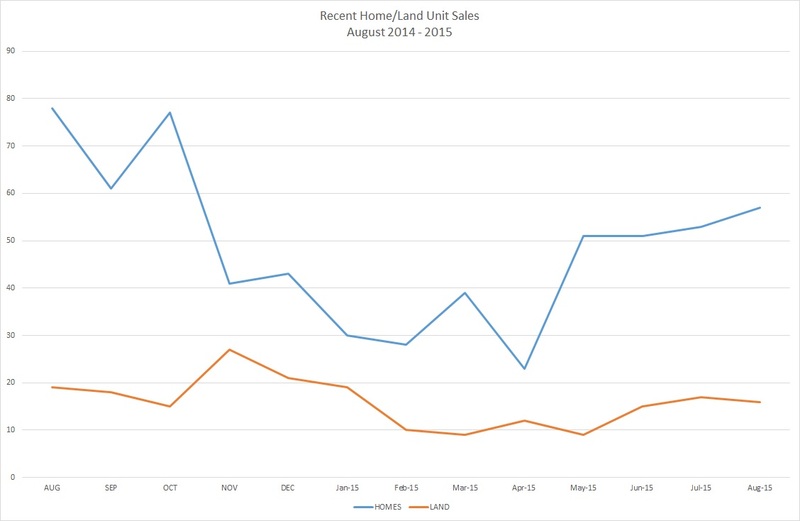 However, the total number of units sold was 28% fewer homes than in August of 2014. This is in harmony with the Volume sold at 27% less than August of 2014. While the units sold is still above the yearly average, we will soon be entering the decline of winter sales. September and October are still fairly strong months to look forward too before we hit Fall and Winter figures. While some may choose to withdraw their properties during these months, those that remain on the market are the ones that will be seen and most likely to sale. Homes Sold This Month: 56 – This is for the entire MLS for the Highlands/Cashiers Board of Realtors (BOR). There are approximately 73 offices in our BOR. Average Sales per Month 1 Year Average: 49 – This is a 6% increase in overall sales. Inventory: 24months – This is another slight decrease, which is good news for sellers. A healthy market is considered by many to be less than 6 months. DOM: 400 – This number continues to drop. The continued market increase in sales has helped to lower this number. Average DOM (YOY): 463 – Unchanged. Sellers should not expect their home to move quickly, unless it is very well positioned. Median Sales Price: $325,000 – This was a substantial rise. Average List/Sell Ratio: 89.45 – Homes have been selling from 81 – 97% of their listing price. In order to get a quicker sale, homeowners should consult with their broker to determine a realistic selling price. You may also CLICK HERE to get an estimate of your home value. It has been clear in comparing recent sales with Tax Assessment that the Tax Assessed value has been consistently high. Macon County reassessed and gave new values this year. Jackson County is currently reassessing. They must have new values for 2016 Tax Year. While values in property may drop, the county can not lose revenue. In order to compensate for possibly lower property values, the tax rate is expected to increase. Synopsis: As we near the slower part of the sales season, sellers should possibly consider a re-evaluation by their broker. Also, the total number of units sold in comparison with the current inventory suggests one should expect to position competitively, if a sale is to be expected any time soon. Average List/Sell Price Ratio: 83.1 Overall prices appear to remain above what the market will sustain at this point. 53% of home sales ranged from $200,000-$750,000. Homes are clearly out selling land. Sellers should carefully consider their pricing to take advantage of a sale this year. While the leaf season attracts visitors, attractive pricing is what brings buyers. Buyers should not hesitate. This is still a very attractive market for buyers. .